People in some weird way need monsters. There are monsters in the Bible, in the Gilgamesh, on cave paintings, and in every culture over Earth. Everywhere in every time period there are monster stories. Each monster is a way for people to work out their own fears, their own what ifs. As certain fears in society grow so to do their associated monsters. There is also a kind of situational fear that people like to work out with monsters. What would happen if I was in this scenario, what would I do? Our brains are asking us to work on these scenarios so that we can prepare ourselves. The recent upswing in Zombies in my mind has almost everything to do with number 2. This is my opinion and I only have anecdotal evidence to back this up. Walking Dead and the major zombie phenomenon grew in extreme popularity during the recession of 2008. During recessions many people begin to question whether civilization will survive, and more often how they will survive without a job. There are macro and micro aspects to this fear. On the micro level there is the anxiety of not having enough resources for yourself or your family. On the macro level there are worries about the State/Federal debt burdens and what the fall out of it could be. These are the fears that people work out through reading and watching Zombie shows like the Walking Dead. In the Walking Dead we see people in bleak circumstances but are still able to survive and maintain a level of humanity. They are able to grapple with and some how control the tangibilized version of our own fears. Beyond the fears being worked out with Zombies there are a few other aspects that make them more or less appealing depending on the mood of the times. 1) Zombies are us. Zombies are literally made from people. The zombie could be a loved one, or your neighbor, they could be your own mother. 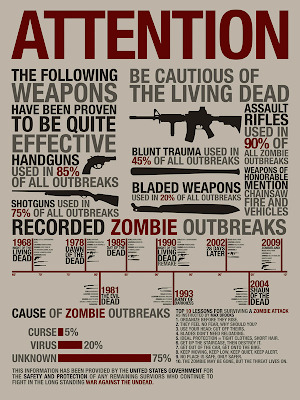 2) Zombies are scientifically plausible. Zombies may be considered to be one of the more realistic monsters. Their pseudo realism may be why they grow in popularity at an apex of real fears (Economic recessions, Wars, Terrorism). Other fantastical monsters tend to grow popular during periods of calm and prosperity. 3) Non personal, non intelligent - Zombies can represent this massive unpinpoitable evil that does not have a purpose or a true motivation. They are not plotting, or scheming, they are the undefined evil, personified into a tangible form. How long will the current Zombie wave last? It is hard to say. Parts of it may go on for a long while. I for one can see the show Walking Dead going on for a long while. However, the other zombie shows/movies/games will begin to fall away. Eventually, a new monster will have its day in the sun, (or the moon light) and zombies will rest for a time, waiting for their moment to return.